In conjunction with 104.7 The Fish and their sponsor Chick-fil-a, The Gift of Music Foundation helped play a part in making some “FISH Christmas Wishes” come true! Here’s one more story of how we take action, because we know that music matters! 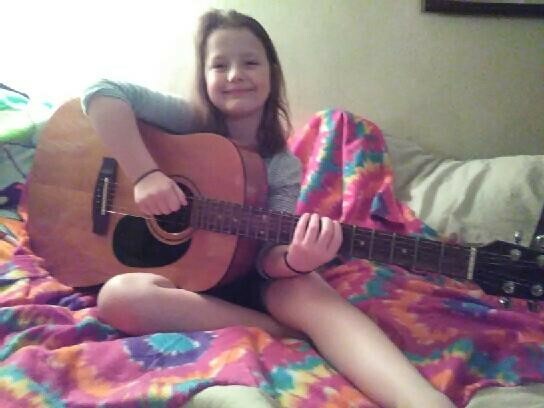 Baylee lives with her mother and father and 2 other siblings in a 1 room “extended stay motel.” They lost their home due to a job loss last year, but Baylee wanted a guitar more than anything. She’s 8 years old, and already writing songs – she even showed us her notebook! Thanks to our very kind supporters, The Gift of Music Foundation made sure Baylee’s music career is off to a great start! The FISH Christmas Wish fund added $1,500 for a rent deposit for a permanent new home, and $500 in gift cards for Christmas. What a happy outcome! You can help The Gift of Music Foundation make more and more of these types of wishes come true. Make your tax-deductible contribution today – because music matters!